UNCASVILLE, Conn. (Nov. 4th, 2011) – Though he spent the duration of his training camp preparing to face former world champion Oliver McCall, undefeated Polish heavyweight Mariusz Wach isn’t concerned with having to stand toe-to-toe with a new opponent Saturday night at Mohegan Sun. Wach (25-0, 13 KOs) will now defend his World Boxing Council (WBC) International heavyweight title against 29th-ranked challenger Jason Gavern (21-8-4, 10 KOs) of Kissimmee, Fla., in the 12-round main event of Jimmy Burchfield’s Classic Entertainment & Sports’ “November Reign” show, scheduled for Saturday, Nov. 5, 2011 at the Mohegan Sun Arena and presented in association with Global Boxing and Joe DeGuardia’s Star Boxing. Both fighters clocked in at similar weights Friday; Wach weighed 248 pounds and Gavern tipped the scales at 248 ¼ pounds. Wach is currently ranked No. 8 in the WBC, and Saturday will be his first title defense since he won the crown with a fourth-round knockout victory over Kevin McBride in July. All $105 ringside tickets for “November Reign” are sold out, but tickets are still available at $65 and $40 and can be purchased by calling CES at 401.724.2253/2254 or Ticketmaster at 1.800.745.3000. Fans can also purchase tickets online at www.cesboxing.com, www.ticketmaster.com, or at the Mohegan Sun Box Office. 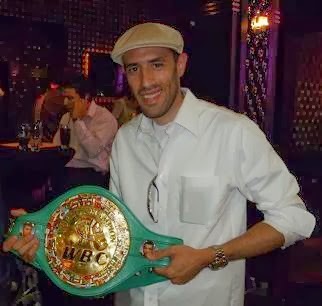 Four months after beating Derrick Findley at Mohegan Sun to capture the WBC U.S. National Boxing Council (USNBC) middleweight title, Elvin Ayala (24-5-1, 11 KOs) of New Haven will face veteran Juan Astorga (15-7-1, 10 KOs) of Thornton, Colo., in a 10-round non-title bout. Each of Astorga’s last four wins have come by knockout while Ayala has won four consecutive bouts dating back to February. “November Reign” will also feature a 10-round North American Boxing Federation (NABF) and North American Boxing Organization (NABO) middleweight title bout between current NABO champion Patrick Majewski (17-0, 11 KOs) of Atlantic City, N.J., and challenger Jose Miguel Torres (22-5, 19 KOs) of Miami, Fla. Majewski won the NABO title with a unanimous-decision victory over Marcus Upshaw in June. Originally from Magangue, Colombia, the 32-year-old Torres has won two of his last three fights. The undercard also includes Rick Dawson (4-0, 1 KO) of New Haven facing Queens native Borngod Washington (2-9) in a four-round super middleweight bout, in addition to the return of heavyweight Artur Szpilka (7-0, 5 KOs) of Wieliczka, Poland, who will battle heavyweight David Saulsberry (7-3, 7 KOs) of Greenville, Ky., in a six-round bout. New Haven’s Edwin Soto (7-0-1, 3 KOs) will face Diego Pereira (6-0, 2 KOs) of Pawtucket, R.I., in a six-round battle of unbeaten, and junior featherweight Josh Crespo (0-0-1) will battle newcomer Nate Green of New Haven in a four-round bout. Cruiserweight Jose Torres (0-1) of Springfield, Mass., will face Francwa Russell of Chicago in a four-round bout in Russell’s pro debut; junior welterweight Christian Lao (2-1, 1 KO) of New Haven will face Antonio Chaves Fernandez (0-5) of Brockton, Mass., in a four-round bout; and Hartford welterweight Javier Flores (5-0, 5 KOs) will face Bryan Abraham (5-9-2, 5 KOs) of Schenectady, N.Y., in a six-round bout. Super featherweight Kamil Laszczyk (4-0, 3 KOs) of North Bergen will face Chris Montoya Jr. (2-4, 1 KO) of Salt Lake City in a four-round bout. For more information on “November Reign,” visit www.cesboxing.com or www.mohegansun.com. Doors open at 6:30 p.m., with the first bout scheduled for 7:30 p.m.